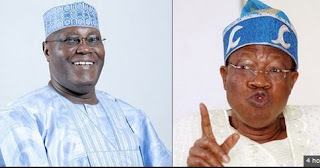 The Federal Government has advised the U.S. to be cautious in issuing visa to the PDP’s Presidential candidate, Alhaji Atiku Abubakar who for many years, had been denied the document. The Minister of Information and Culture, Alhaji Lai Mohammed, was quoted saying at an interactive session with media executives in Abuja on Thursday. He said, while the U.S. has the prerogative of whom to a sue visa, it should be mindful of the timing, in order not to give the impression that Atiku has been endorsed by the U.S. government. “I am sure you will all recall the Jefferson’s case and the cold 90,000 U.S. dollar in the fridge. “We are not unaware that Atiku has engaged the services of some lobbyists to persuade the U.S to issue e visa to him.